Catch the colour and save your clothes! When you need something done properly you go to an expert don’t you? Well Dylon are colour experts. It’s as simple as that. 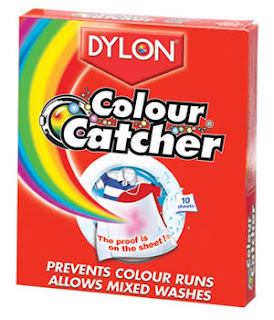 Which is why we are now stocking some of their most popular products… such as Dylon Colour Catcher. But what is Colour Catcher®? Every time you wash bright or dark coloured clothes, traces of dye bleed into your laundry. These dyes may completely ruin your wash or leave your clothes with a dull, grubby appearance. Colour Catcher® is a treated anti‐transfer sheet with special ingredients which act like a magnet, removing loose dyes and dirt during the washing process. Hard to believe this is possible? See the proof for yourself and keep an eye out for more articles about our growing range of amazing Dylon products.